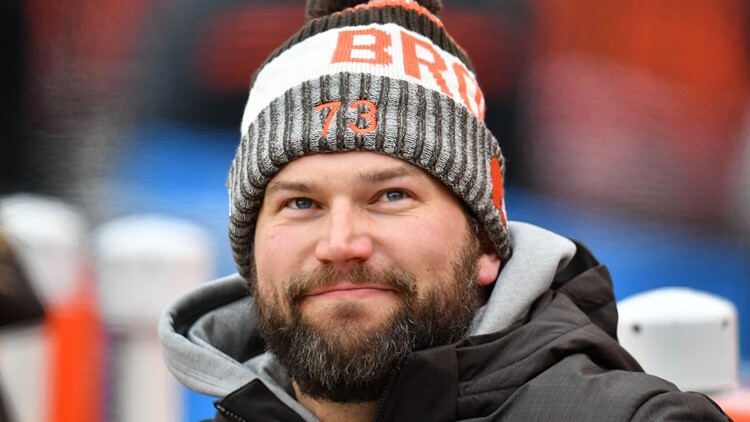 Former Pro Bowl left tackle Joe Thomas looks on at the scoreboard during a game at FirstEnergy Stadium. Former Cleveland Browns All-Pro tackle Joe Thomas has made a dream Super Bowl trip come true for a local Coast Guard veteran. 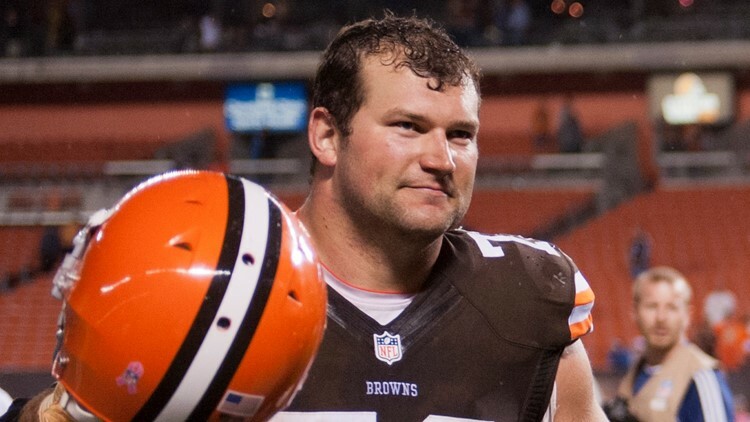 CLEVELAND — Former Cleveland Browns All-Pro left tackle Joe Thomas has had a high level of appreciation for the United States armed forces, so much so that he joined the USO Tour and made a 10,000-mile trip to the Middle East to visit with troops during the 2010 offseason. Even though Thomas is retired, he still remains committed to helping those who serve. In partnership with USAA and the USO of Northern Ohio, Thomas helped make a dream come true for U.S. Coast Guard CWO (retired) Jonathan “Jay” MacKenzie. A lifelong football fan, MacKenzie dreamed of going to the Super Bowl. Because of Thomas, USAA and the USO of Northern Ohio, MacKenzie will be inside Mercedes-Benz Stadium in Atlanta, Georgia on Sunday, February 3, to watch the AFC Champion New England Patriots and NFC Champion Los Angeles Rams compete for the right to hoist the Lombardi Trophy. 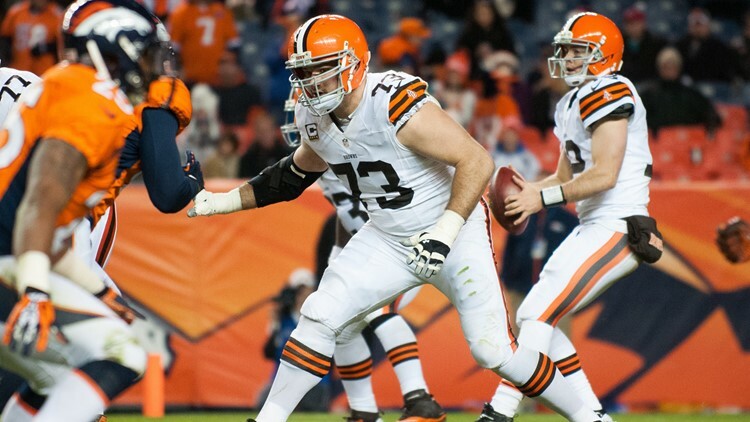 Cleveland Browns left tackle Joe Thomas prepares to deliver a block during a game against the Denver Broncos at Sports Authority Field at Mile High in Denver, Colorado on December 23, 2012. MacKenzie served in the Coast Guard from 1984-2006 and fulfilled assignments in Alabama, Texas, Massachusetts, Florida, New York and Ohio, as well as 13 deployments/patrols to the Caribbean. MacKenzie completed law enforcement, drug interdiction and search and rescue missions, while assisting with electronics support and humanitarian efforts. During his career, MacKenzie was recognized with the Coast Guard Achievement medal, two National Defense medals, the Armed Forces Expeditionary Medal, Global War on Terrorism Medal and two Humanitarian Service medals. Although retired from active duty, MacKenzie still serves the country as a civilian employee for the Coast Guard, working in the Information Technology Division of the Coast Guard Base in Cleveland. Cleveland Browns left tackle Joe Thomas talks to his teammates prior to the start of an AFC North Division game against the Cincinnati Bengals at FirstEnergy Stadium in Cleveland, Ohio on September 29, 2013. Securing the two tickets for MacKenzie was the latest in a long line of charitable endeavors undertaken by Thomas. Thomas remains the only player in Browns history to be the organization’s Walter Payton Man of the Year on multiple occasions. Thomas was honored with the award in 2010, 2012 and 2016, and was a finalist for the 2012 NFL Walter Payton Man of the Year Award. Also, Thomas is the only player in Browns history selected for the PFWA (Pro Football Writers’ Association) Dino Lucarelli Good Guy Award multiple times and was a two-time Player of the Year choice by the local chapter. Thomas received the Browns’ Salute to Service Award in both 2016 and 2017, created a program to give game tickets to service members through a partnership with the USO of Northern Ohio, and made a week-long trip to military installations in the Middle East to visit with troops as part of the NFL/USO Tour. 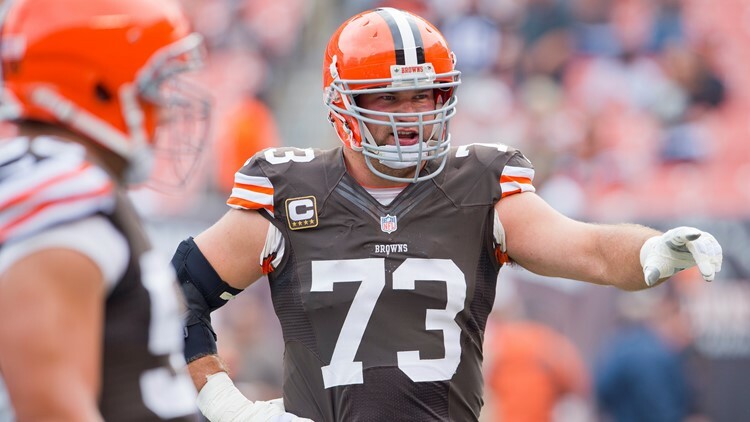 Cleveland Browns left tackle Joe Thomas celebrates after defeating the Buffalo Bills at FirstEnergy Stadium in Cleveland, Ohio on October 3, 2013. Thomas and his wife, Annie, have given support to numerous charitable organizations in Northeast Ohio, including the Cleveland Kids in Need Resource Center, Providence House, the Greater Cleveland Food Bank and Cleveland Animal Protective League (APL). In October of 2018, Thomas was honored by the Browns when they enshrined the number “10,363” into the Ring of Honor at FirstEnergy Stadium. The honor was in recognition of his consecutive snaps played before suffering a career-ending triceps injury in October of 2017. In December of 2016, Thomas was selected to his 10th consecutive Pro Bowl, and went 10 for 10 in all-star game nods over his first decade with the Browns. With that selection, Thomas became the first Browns player ever selected to participate in 10 Pro Bowls.